My name is Keoki Massad and I am a senior currently attending the University of Portland working towards a double degree in Mechanical Engineering and Computer Science with a minor in Mathematics. 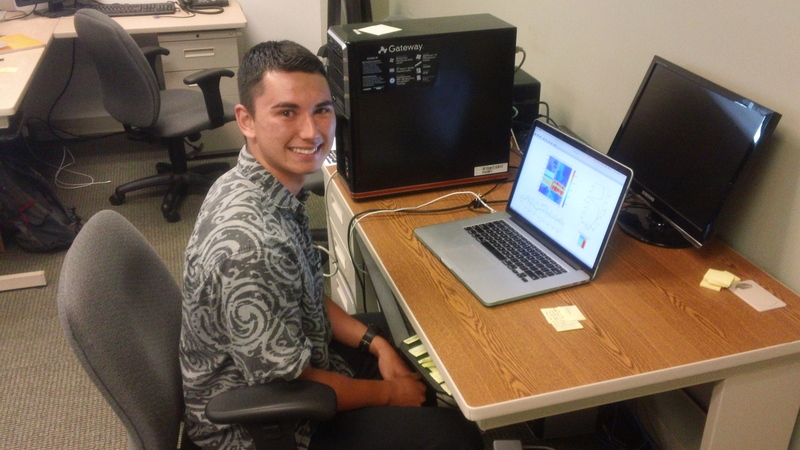 I am from Honolulu, Hawaii and am a 2014 graduate from the Kamehameha Schools Kapalama. On my free time, I like to play sports such as soccer and to surf with family and friends. Given that the sun’s magnetic field is responsible for many phenomena in space that pose possible dangers, being able to observe the sun’s magnetic field can allow us to better prepare ourselves against these potentially dangerous events. Currently, the scientists working with the Cryogenic Near Infrared Spectro-Polarimeter (CryoNIRSP) have data in the form of images of polarized dual-beam spectra, but do not have a specific way to analyze these images. When the corresponding pixels from the opposite beams of the spectral image are mapped together and then added/subtracted from each other, the polarization of the light being observed can be determined. The purpose of this project was to create an algorithm and interface that the scientists can use to analyze and map the corresponding pixels of specific segments of the polarized dual-beam spectra that are captured through the CryoNIRSP. With the ability to determine the polarization of the light coming from the corona of the sun, the weak magnetic field at that point in space can be observed. We used Python coding language and many of its public modules, such as Matplotlib, to create the interface where the Flexible Image Transport System (FITS) image of the polarized dual-beam spectra is displayed and analyzed. We developed additional click and key press events that were uniquely adapted to enable/disable features in which the original FITS image could be analyzed. These features allow the user to determine the type of data and area in which they want to analyze, depending upon their preferences and needs. Most importantly, the algorithm and the interface are able to find and display the correlation of a small rectangle in a larger boundary rectangle through the implementation of a cross correlation function. This correlation brings us closer to the ability to correctly and accurately map the corresponding pixels of orthogonal polarizations together. This interface can be implemented to analyze FITS images of other spectra due to the simplicity of the functions that the key press events call and the flexibility of Python to allow for modification to complete more specific tasks. When the mapping of the corresponding pixels is completed, the scientists using the CryoNIRSP at the Daniel K. Inouye Solar Telescope on the summit of Haleakal? on Maui will be able to accurately observe the magnetic field of the corona of the sun.